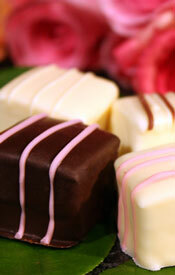 Marshmallows Dipped in Chocolate | Assorted Flavors "DIPS" 16 pc Gift Box Discounts Apply ! FREE STANDARD SHIPPING for You with $50 purchase (sent to a single address in the US) We cannot guarantee your order will make it during hot weather using ground delivery. Please use express. Gourmet marshmallows covered in creamy dark and white chocolates. Experience the creamy texture of Pete's all-natural assorted mallows, elegantly wrapped in a our signature gift box. Assorted flavors (strawberry, vanilla & chocolate). Oh my gosh the best marshmallows ever. The best marshmallows I have ever eaten. These are the bomb. Keep up the sweet work. My girlfriend has come to expect these for every special occassion. Sign Me Up For Discounts Up to 20%!